- Stainless steel clips, nylon cord and EVA foam buoy, durable for long time use. - Lightweight and compact, very easy to carry. A great accessory for kayak or boat to anchor. - Attach one clip on your belt, deck pad eye, PVC D-ring or seat strap belt loop anywhere you want. - Attach the other clip to your grip, wade net, waterproof camera box, pliers and any accessory. 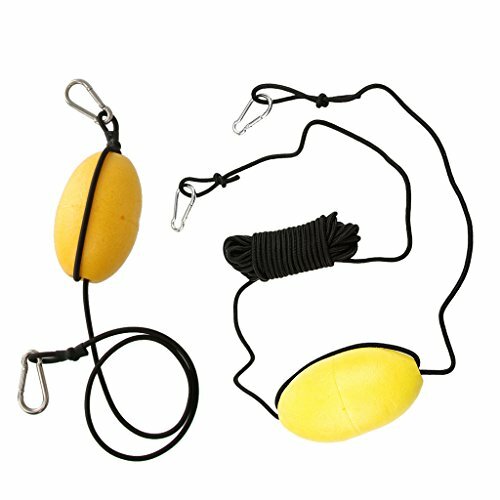 - It can be used as a kayak, canoe, and jet ski floating leash, and a floating anchor line. Stainless steel clips, nylon cord and EVA foam buoy, durable for long time use. Attach the other clip to your grip, wade net, waterproof camera box, pliers and any accessory. It can be used as a kayak, canoe, and jet ski floating leash, and a floating anchor line.